Our family and team at Coastal Turf would like to thank you all for your support in 2018. Your support of our business has allowed us to continue to supply beautiful lawns to the Gold Coast, Tweed and Byron regions. This year our family and farm need a small break to rejuvenate after a wonderful year of supply gorgeous lawns. We will be closed from the 24th December until the 14th January. Please send through any enquiries and we will assist you as quickly as possible. Merry Christmas everyone! This time of year can feel so rushed and stressful. And the best place to destress is in nature. And the best place to find nature near you is on your new lawn. This week we only have Saturday deliveries available. Please book early so you are not disappointed. Please call 0266763695 to place all orders. 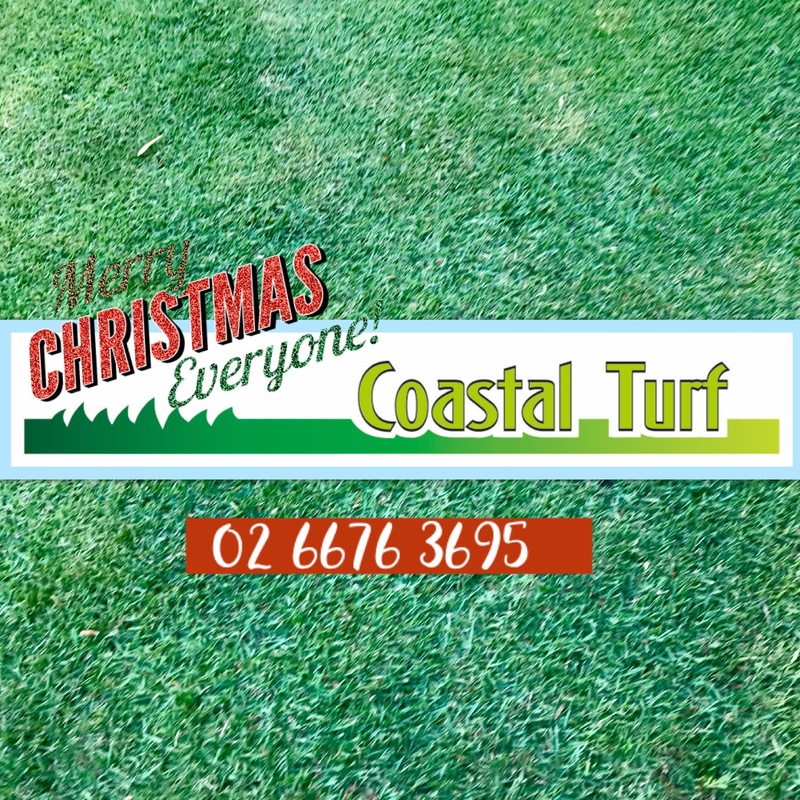 Coastal Turf’s team would like to thank everyone for your support of our family business and look forward to creating new green stress free spaces in the New year. This morning at breakfast, the Coastal Turf family was sitting around eating Vegemite on Toast and I was scrolling through my facebook feed as I listened to the chatting and sipping tea. And then this picture popped up on my feed. And my face got wide eyed and a little bit frightened. How did Facebook know we where eating Vegemite! Is my phone turning on me! So of course I showed everyone else at the table. 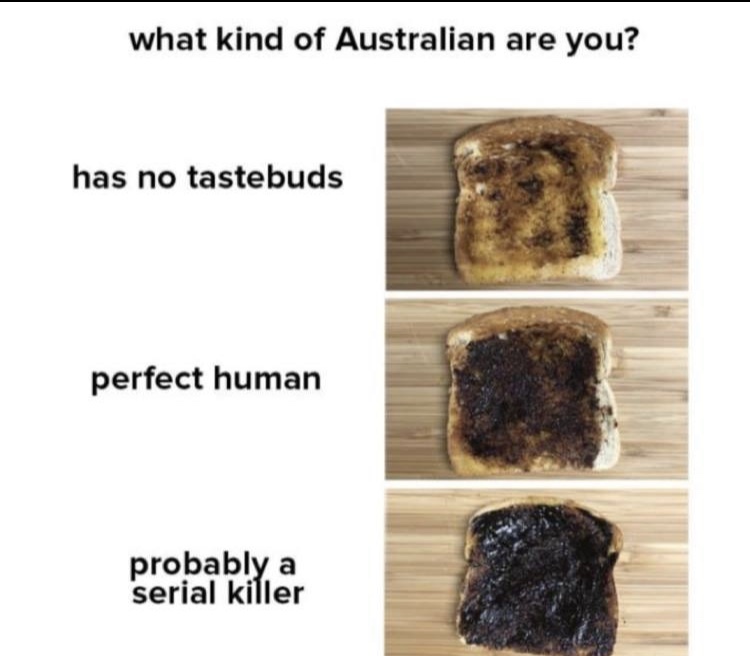 And they did not see the spookiness of eating Vegemite and it popping up on my feed. They laughed and said it looked like some the top dressing jobs they had seen in the last couple of weeks. Top dressing your lawn at this time of year is a great idea. It helps to put great nutrients back around the roots system and feed the lawn before the heat of Summer. It also helps the roots to trap the water that goes down to its root system, making your lawn more drought tolerant over the heat of the day. But, just like Vegemite, if you under do the top dressing soil, your lawn will not taste the soil’s wonderful nutrients. Over do the top dressing soil, and your lawn will suffocate. The root system will not be able to breathe and the leaves will not see any of the brilliant sunlight. And you may become a lawn serial killer. But if you spread the soil over at a thick consistency, ensuring that a third of the leaf is still visible. Then water in the soil after you have finished. (Kinda like putting the butter on as well) This will drive all the good nutrients down to the roots system and help trap all the moisture in the soil near the roots which is where you really need it to be. So, just like Goldilocks, and a really good piece of Vegemite Toast , spread your top dressing just right! Any questions give us a call! And your lawn can look like this! For extra tips and advice head over to Lawnspiration for lawn maintenance. Wow. It’s the middle of November. It seems like it came so fast. Not long ago I felt like I was still wrapped in jeans and a jumper to keep warm. Now I am trying to work out if I really do have a swim suit that will “fit” me anymore. At the breakfast table this morning my 3 kids and husband and I were talking about all the things we have on over the next couple of weeks. Because school is nearly finished, and Christmas parties are starting , and summer sport finishes, and friends have parties and the list goes on we thought we should get organised. My son is in year 10. So we have a formal next weekend. And my daughter is in year 6 so we have a graduation the week after and a MINI Formal for her (and we still need a dress. AHHH). My youngest has more sporting commitments than I remember saying it was ok to go to. I guess like all families we are full on! I think my husband said something like he had Football Club commitments, but cause I don’t have to drive him to this (hopefully) I didn’t really listen. All Families are all really busy with all the “exciting” stuff our families get up to. Driving people here, getting people here and there, still managing to go to work and sleep occasionally. So the last thing on most of your minds is to install that new lawn. That is where Coastal Turf can come and lend a hand. 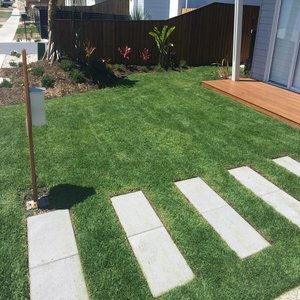 I can’t run your kids around or attend that meeting that none of us really want to go to but have to, but we can arrange to have a qualified Turf Installer come to your place, give you a quote on site, and then install your brand new Coastal Turf lawn with no fuss or bother from you. We take all the hard work out of it. Think about how wonderful it will be to wake up one morning and see dirt and dust, and go to bed that night with a lush beautiful green Coastal Turf lawn surrounding your home. And all you did was make a phone call! Our guys did all the rest of the work for you. Let us take some of the pressure off your family this start of the silly season and get your lawn all ready for the end of the year rush. Imagine this at your place! Call us or email us today and get some stress out of our life. This last couple of weeks have been really super hot. And it’s not even summer yet. And I have been watching various websites and it does seem its gonna get hotter. Have you noticed that some areas just so much hotter than others? Like on one of the 30 degree days I was picking the kids up from their school, or as my husband and I call it, the concrete jungle. There is literally concrete from one side to the other. Which you know is great for handball, but not that great for running around on. And it quite literally felt sooo much hotter there than it was at the farm. Now when we were at the farm we don’t have a lot of tress to shade us. We have big wide open paddocks. Because these are the best way to grow as much turf as possible as quickly as we can to become your new lawn. And we were out in the sun in the middle of the day. It was hot. But really bearable. The kids school has large tall concrete buildings. A huge giant tree. Heaps of concrete. And a small grasses area. And an area with synthetic grass for small kids to sit. When we came to the school at 3.15pm, the school felt really HOT. And I know that part of it was because we were in the middle of town now. And that the buildings block the wind. But a large part of it is how much the concrete radiates the heat! I now know why my kids never wear a jumper to school. They won’t have to! So I was not really surprised when one of my friends sent me this U-Tube movie today. Have a look at the huge difference that cool natural green grass can make to the surrounding environment. Or head over to the link and see the video. It really makes you think! And I am for sure happy to be at the farm rather than at school. Well for heaps of reasons. 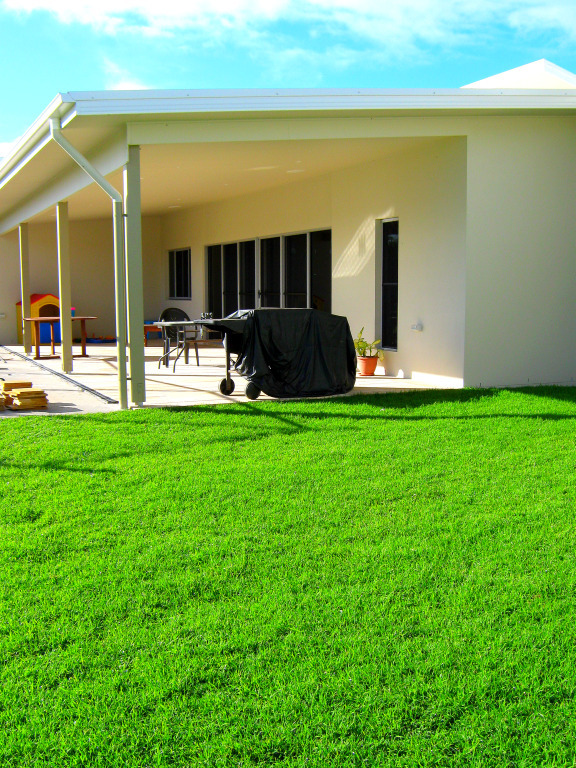 But think how much cooler your home, your work or your kids school can be with a natural green grass lawn. I know where I would much rather sit this weekend…. I have friends that love a good farmers market. They love strolling through the markets and talking to the people who grow the food they are about to consume. Some of my other friends love going to farm shed Veggie Shacks to chat with the people, and see the dirt still on some of the veggies. And it really does impress upon me the importance of knowing where the products you buy come from. And that is why I think that it is so important for you guys to be able to come out to our farm and walk across the paddocks to help decide which variety would be best for your yard. The hashtag #knowyourfarmer is getting around. 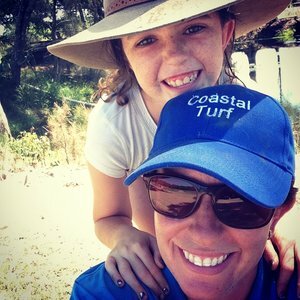 So at Coastal Turf we want you to come and get to know us, and then get to know your lawn before it leaves our paddocks. And I think that your new lawn, with its ability to produce the air that you will breath, is just as important as the food you consume. So get to know your farmer. Know the how’s and why’s of your new lawns production and the best way to continue its new life as your lawn. At the moment I am on crutches. It seems Mums are not immune to a broken bone or two either. I had one of those moments where I did something that I always tell the kids is too dangerous to do and “…you will hurt yourself if you jump off that…”Well I did. And I have taught them a lesson about listening to what I say. It has also taught me a lesson about listening to what I say. So I am not that mobile to show you around the farm at the moment. But John, my father is down at the farm in the mornings and can show you a Blue Couch or too. 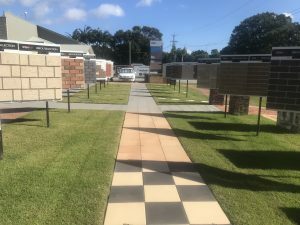 But if afternoons are more your style, then are display yard at JH Williams at Chinderah (near coffee and cake too) is always available for you to walk across, touch and smell. And I will be ready on the phone to help with any queries. So #knowyourfarmer and know your #lawn and get the best out of your #home. Turning Mud into Perfect Palmetto. Is the wet weather getting you down and dirty? Making your house a big grubby mess? Are your kids making your home like the outdoors are coming inside because they are bringing in lots of mud? Do you have that wet dog mud smell through your home? With such wet weather meant to stick around for a while, having a lawn to quickly absorb the beautiful rain and use it for good, to grow a sweet smelling green lawn, makes your life happier and simpler. Installing a Coastal Turf Palmetto Lawn at your place means you can take away the mud monsters from your life. Find your family again under all that mud masks. A Palmetto Buffalo lawn gives you the peace of mind of knowing that your lawn with be thick and lush all year round. Being shade tolerant down to a minimum of 3 hours of direct sunlight per day, your lawn will thrive in small or large lawns. And you know while all your neighbours are out there mowing every single weekend, you will be sitting back real axing on your lawn. Watch your kids use your lawn for fun and games. The Palmetto Buffalo lawn will create the perfect lawn for your family to enjoy bare footed. If your kids are like mine, shoes were thrown under the trampoline and disregarded to die under the swing set. That was until we installed the Palmetto Buffalo lawn around our trampoline, and the kids can walk bare footed to the trampoline. Not more shoes thrown across the lawn. Just happy little feet, as they cruise across the spongey lawn to bounce away and swing to the blue skies with their toes in the air. Get in touch with us today to arrange a beautiful Palmetto Lawn to get rid of the mud monsters in your life. Dear Busy Parent who has taken the time to read this. I really appreciate the time you have stolen for yourself to research about your lawn. It’s those quick 5 to 10 minutes alone that just make your day worth living. As I sit here and type this my 10 year old every 40 seconds says “Mum, listen to this Meme,” “Mum, do we own a skate board?” “Mum, do you know the Code to get into my sisters iPad?” “Mum….” “Mum…” “Mum…” Do you think it would help if I changed my name? They would probably say that in rhythm as well. I even thought I would venture away and lock myself in the toilet room to escape for 5 minutes. But no. Not only did he find me and continue to chat to me through the door, then the dog found me as well and whined outside the door. This whole Parenting gig is pretty full on. Although I did learn as interesting fact about, wait no, I didn’t. I had to tune out to stay sane. There is never a minute that is not full of SOMETHING. Something good, something crazy, something fun, something to clean up. Something to take a big breathe about. So for you to have taken the time to read this, I thank you. And also realise that it must be really important to you to find a wonderful new lawn for your home. A place where your talkers can go outside onto and not bring back in a lot of mess. A new lawn that smells beautiful in the morning dew. A green space that makes you smile every single time you see it. A lawn where you know your family is safe, and you can take a break. I know that the precious little time that you do have for yourself is really important. Be those the small nap breaks that little kids take, or those precious hours between school pick ups. Or just times any times that you can steal for yourself, you know like when they don’t know that you are in the toilet and trapped. Blessed be those moments. As a mum, I want to encourage Parents to have more of those moments. More peaceful moments. 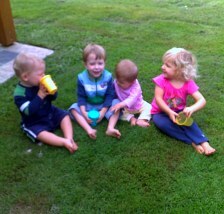 More giggle moments of your kids on the lawn. Rolling, kicking a ball or running playing. By having a Coastal Turf lawn installed at your home by our qualified and experienced team, you know you are going to have an Instant Lawn. An instant place for your family to enjoy the green grass around your home. Let us take care of all the worries and hard work associated with creating a new lawn play area for your family. Give yourself a break from the crazy and gift yourself some time. Time is such a precious gift. And one that you really show give to yourself. Time to smile, time to laugh and time to have fun. And what better place to do that when your kids are outside on the lawn. Playing. And you don’t have to be! So get in contact with us today to arrange one of the boys to come and give you a quote on a new lawn of sanity. What makes a good Coastal Lawn? What makes a good/perfect coastal lawn? Is it the green? Is it the colour? Is the softness? Is it the wearability? Is it the salt tolerance? Is it the shade tolerance? Is it the cooling effects/ the air conditioning effect? Is it the environmental benefits? It is all of these. Or is it the way that it makes us all “feel”. That feeling of Home. The feeling of complete comfort and relaxation of coming home. Is it the wave of happiness that floods our system when we turn into our street, cruise down to our driveway, and gaze upon our destination. Our Home. Framed by our gorgeous green lawn. That feeling of completeness that only coming Home will give you. That feeling of joy when you see your kids play on the lawn, laughing and giggling. The feeling of peace when you send the kids outside to play on the grass while you enjoy that 5 minutes of peace. So make that feeling last all day by having a fantastic Coastal Turf Lawn. Make your lawn is the first thing you see as you come home and the last thing you see when you leave. 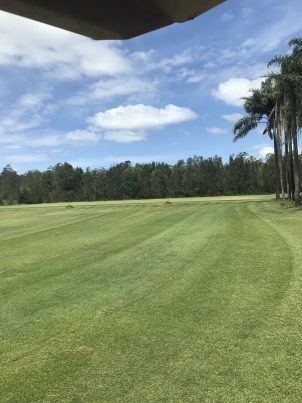 Coastal Turf is a family farm located near the beautiful Cabarita Beach. 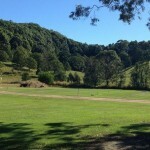 As a smaller farm, we do not usually create our grass paddocks to go onto to become large Sporting playing fields. But rather family homes. 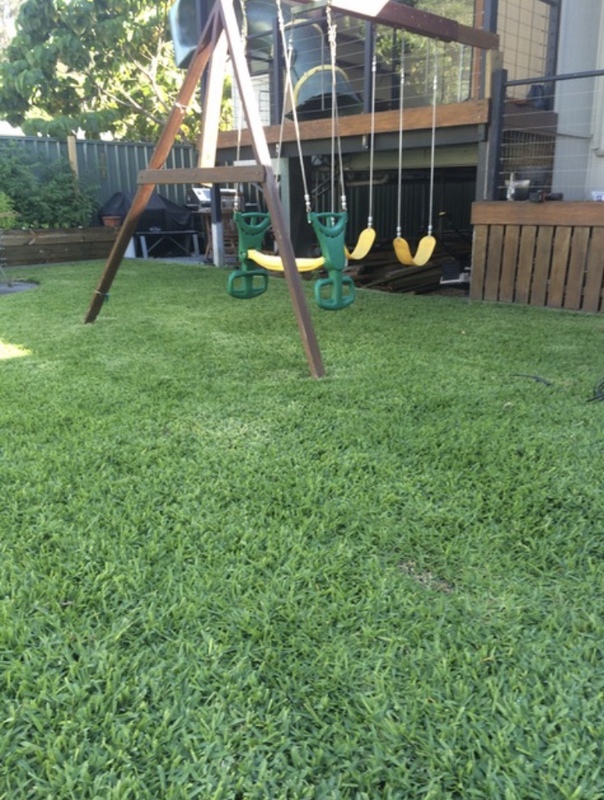 Our family enjoys creating soft, robust, Green grasses for other families to enjoy as their lawn. As a mother of 3 kids, I know how important having a place of soft green grass to play is. I also know how really important service is. Being a family, you have enough running around and exciting things to do without also trying to get your lawn organised too. At our farm we grow what we considered to be the best grasses for the Coastal regions. Coastal Turf has partnered with expert installers, who know all the ins and outs of creating a family lawn. This is really important. Because if you get the right preparation done, your lawn will be thicker, softer, greener for longer without much effort from you. Our installers also offer the professional service of coming to your home before the job starts to talk to you one on one to find out exactly what you want to do. This gives you the piece of mind that your yard is Your Yard. 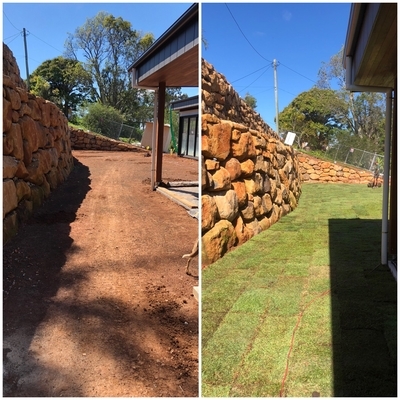 So give us a call today to discuss the best new lawn for your place, or send us a message and I will arrange for one of the boys to come and provide you a with the personal one on one service. Find out how much turf you need! Copyright © 2019 CoastalTurf.com.au. All Rights Reserved.